My husband and I turned 25 this week. I am in a second marriage. My husband and I just celebrated 25 years! What a milestone! We have been congratulated by family and friends and marked the occasion by taking our first cruise. The most meaningful reason for our grand celebration, however, was birthed out of the public eye and originated deep in my heart long ago. You see, I am the one that left my first marriage. I didn’t just leave, I ran, and I ran with my tail between my legs. If someone had asked me back then what issues I was running from, I would have been unable to name them, and since unnamed issues cannot be addressed, I left before I even tried to solve anything. Once the second marriage began, it too became difficult. So there I stood in my living room one day having come full circle. I was back in a marriage that had gotten difficult, not because there was something terribly wrong with my spouse, but because relationships by definition require effort and every couple faces obstacles. Partnering with a person to respond well to trying circumstances as a team takes courage and relational skill. I knew one thing for sure, though. I didn’t want another divorce. Though the divorce in my first marriage had been amiable (I didn’t even change my name back), I hadn’t liked the process of dismantling a relationship. So I asked God to teach me how to stay and to teach me now to love. Now we are 25 years together. Please don’t hear me saying that if a marriage dissolves it means God didn’t show up. He always shows up and His answers are perfectly tailored to each situation (notice in Scripture there is no predictable way Jesus healed people or God won battles). I am saying, however, that I am unbelievably grateful that God transformed my heart enough to make it to this anniversary, and I am better at loving people than I used to be. The greatest reason I am still standing in this marriage on this milestone is because God heard my requests all those years ago and He showed up to help me. Happy 25, dear husband. Thank you for marrying a woman who didn’t know how to stay long in relationships or love well in the midst of difficulties. Others may have tired of me, but you still love me on this anniversary, and I am incredibly grateful. LOVE isn’t in the Falling. 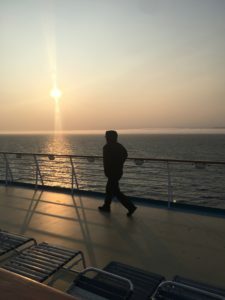 Picture Explanation: An Alaskan cruise has always been on our bucket list, so this is what we picked for our celebration. 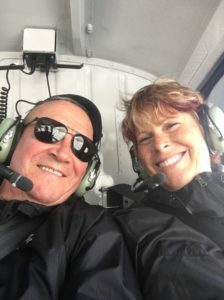 We landed in a helicopter on a glacier, rafted down a remote river and spotted Orca whales. 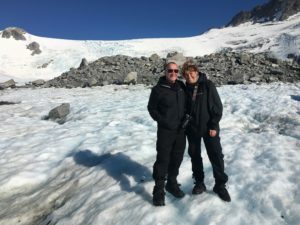 We spent hours on a ship’s deck breathing in the most amazing fresh air blown in over Pacific waters, and we drank water straight from a glacier, the freshest (and coldest) water we will probably ever consume. Away from the stress of normal life, we enjoyed each other’s company. An Alaskan cruise is now scratched off the list. © 2018 by Oaks Ministries. All rights reserved. Congratulations to a very special couple! You are a blessing to many! 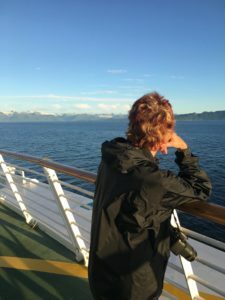 I’m so grateful we got to experience the Alaskan cruise with you! I appreciate your realness and authenticity, my friend. Happy 25th!! Having you and your hubby there was a bonus. Made a great trip even better. Love your heart, Laurie…..so grateful I got “to be” with you when you celebrated with our table on the cruise. Marriage is the laboratory of letting God show us our weakness and allowing Him to give us what we lack. You and John have what it takes. love to you both. Thank you, my sweet dinner table companion. Being with you was a reminder of the preciousness of marriage. We must enjoy every day. Thank you dear bridesmaid friend! We have been friends for a long time. Thanks for hanging with me, too. Thank you for sharing what God has brought you through. Congratulations!! 24 years of loving the most sacrificial people I’ve ever met. Sending you love for the next 25, sweetie Mom! I knew it was coming, and here it is! 25!! Praise to the Father for “stick-to-it-iveness” for both of you through thick and thin! Happy anniversary, dear friends. So glad you got to visit my first home land. I forgot it was your first home land! We have a great time. "The people in our lives can’t hear about Jesus unless someone tells them, and they can’t know what Jesus is like unless they interact with someone who exhibits His character. "